World Oceans Day is June 8th and there is still time to celebrate! Put on a blue shirt and forge ahead with these ten fun ways to celebrate World Oceans Day with your class or family. 1. Skipper your crew to a World Oceans Day event in your area. From art contests to film festivals to hands-on exhibits, there are ocean activities taking place around the world. 2. Navigate your way to the World Oceans Day website and check out their last minute celebration ideas. Find ways to help keep plastic out of oceans and landfills with your students or family. 3. Google is charting new territory with its Oceans Street View images. Allow students to explore this stunning collection. 4. Set course to Adrift.org and challenge students to predict the path of floating pollution before they try this engaging interactive. 5. The Smithsonian has made great headway in compiling this diverse collection of ocean-related lesson plans for educators. 6. For landlubbers who can’t venture out to sea, dive into an ocean-themed book for a reading adventure worthy of the high seas. Get started with one of these nautical tales. 7. Ahoy! Teachers, students, and families can join an Ocean Guardian Program and plan a school or community conservation project, submit ocean-themed artwork, stories, or poetry, and even become involved in diving! 8. If you are swamped with lesson planning, check out Help Teaching’s collection of pre-made, ocean-themed worksheets. Or, have your students try our online lessons on Ocean Vocabulary Words, Ocean Zones, Tsunamis, or Tides. 9. Set your bearings to your local aquarium. Students of all ages will enjoy viewing and interacting with the amazing variety of sea life on display. 10. Head to the beach! What better way to celebrate World Oceans Day than by digging in the sand, discovering tide pools, and surfing the waves? 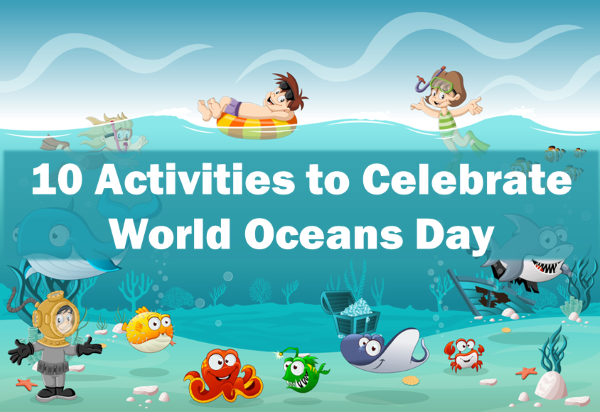 Have other suggestions for celebrating World Oceans Day with students and children? Share them in the comments! Read The Ultimate Guide to Teaching Science for more ways to invigorate your science curriculum and teaching.